ZTE's got designs on the smartphone market in a big way, and its first major offensive of the year is the ZTE Era, a quad-core Tegra 3 running smartphone with a 4.3-inch qHD screen to boot. 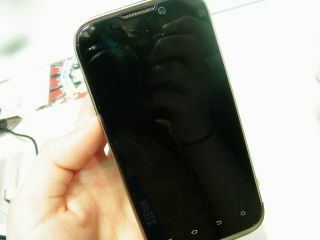 It's not a bad looking phone and it's certainly playing in the same end of the slim-phone pool as the HTC One X – in fact, at 7.8mm thin it's giving HTC's handset a good run for its money. We'll have lots more to say about the ZTE Era and its Mifavour UI later in our full hands on ZTE Era review, but for now feast your eyes on these lovely pictures we've snapped just for you. Sadly, such is the way of things, the demo handset broke so we only have the chassis for you to examine for now - check back later for more. The Era is quite a slinky, lightweight thing even with the security tether that prevented us from running off with it. As it runs Android 4.0 (ICS), the Era comes with soft buttons rather than too many hard ones, although the volume slider is still intact (above) and there's a camera shutter button too. Above you can see the camera hardware - 8MP with autofocus and flash. We'll give this a good going over once ZTE fixes whatever gremlins are plaguing the demo unit. We don't love this bit of the phone (above) which seemed to have a lot of small parts that could potentially ping off and get lost. The build quality, such is ZTE's way, didn't seem to be brilliant but perhaps this means the costs will be kept down.